Read-on and learn more about visiting Florida. Regardless of what your interests, you will find an attraction in Florida to enjoy. From the home of sun, sea, sand and Mickey Mouse. We provide original articles about popular Florida destinations, travel tips, rental cars and more. Wildlife and botanical attractions are among the most popular and include both large parks and zoos and small private gardens. Florida receives more visitors than any other U.S. state. This makes Florida one of the premiere vacation destinations in the world. Florida's amazing history is showcased in museums, monuments, forts and homes throughout the state. Another great tropical destination is Hawaii. Are you travelling with a group or have a large family? We recommend using discount Hawaii van rental. They offer national brand name rentals at reduced rates. We have used their service seminars that our staff has attended on Maui and Oahu. One of our 1st articles is a short list of Florida Rental Car Companies. We are not affiliated with these businesses but we like to acknowledge some industry leaders. 2007-2019 Florida Sun Car Rentals - Discounted SUV's, Vans, Convertibles and Luxury Autos. 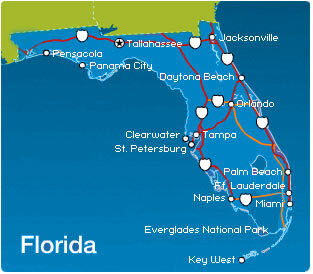 Florida rental cars for Orlando, Miami, Daytona Beach, Tampa and more. Book now, pay later.